Mundon has just emerged from one of the most extensive conservation campaigns that we have had to mount. With generous help from English Heritage we have been able to prevent the threatened collapse of the chancel and conserve the distinctive Georgian murals shown above. We are particularly grateful to our architect, Julian Limentani and the contractors, Bakers of Danbury for a very skilful job. The building is now once again open to visitors (you can just turn up). A final programme of works to the nave, again with English Heritage grant aid, was completed in the Autumn of 2011. This set out to conserve and stabilise the 18th century painted ovals with biblical sayings but has also uncovered very faint medieval murals, which appear to show a king and a devil. St Mary’s is mainly known for its weather boarded timber-framed tower and its outstanding 16th century north porch with carved wooden spandrels. However it also retains a complete set of 18th century box pews and an 18th century brick chancel with distinctive wooden tracery to its north and east windows. 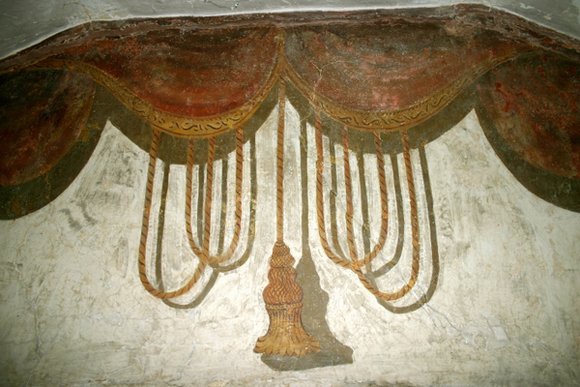 On the east wall is a nave mural showing tassels and bunched curtains being drawn aside from the window in a rare rural attempt at trompe l’oeil. The tower is unusual in having aisles to three sides. When the Friends took the building into care in 1975 it was in a sorry state and much work has been carried out to ensure its survival. The work here, as in so many of our churches, is ongoing and there are currently problems with ground movement, which are being tackled, but the church is much loved and a well-attended annual service is held there. Church is open but internal access will have to be dependent upon permission of the builders. Mundon is one of our churches with an enthusiastic band of local supporters.